Context: The Planck data releases have provided the community with sub-millimetre and radio observations of the full-sky at unprecedented resolutions. We make use of the Planck 353, 545 and 857 GHz maps alongside the IRAS 3000 GHz map. These maps contain information on the cosmic microwave background (CMB), cosmic infrared background (CIB), extragalactic point sources and diffuse thermal dust emission. Aims: We aim to determine the modified black body (MBB) model parameters of thermal dust emission in total intensity and produce all sky maps of pure thermal dust, having separated this Galactic component from the CMB and CIB. 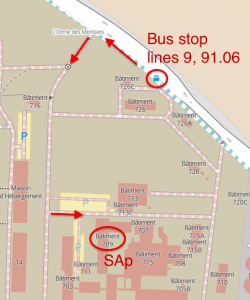 Methods: This separation is completed using a new, sparsity-based, parametric method which we refer to as premise. The method comprises of three main stages: 1) filtering of the raw data to reduce the effect of the CIB on the MBB fit. 2) fitting an MBB model to the filtered data across super-pixels of various sizes determined by the algorithm itself and 3) refining these super-pixel estimates into full resolution maps of the MBB parameters. 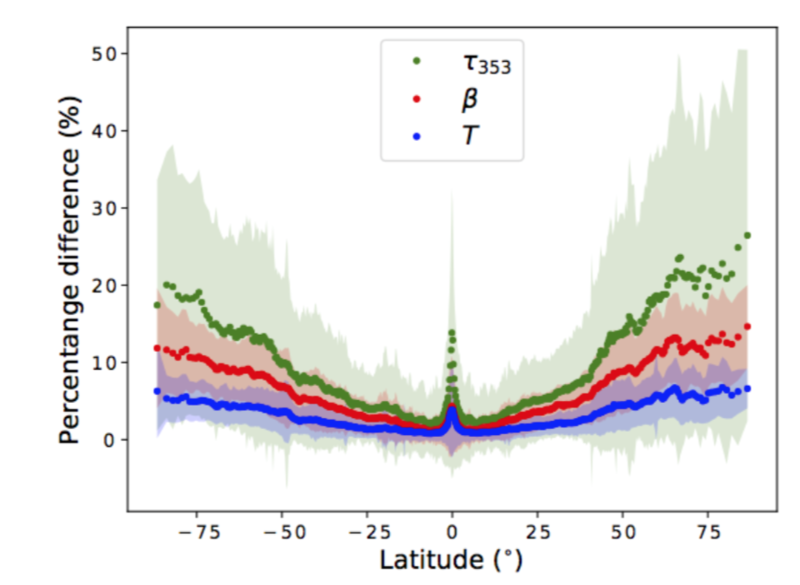 Results: We present our maps of MBB temperature, spectral index and optical depth at 5 arcmin resolution and compare our estimates to those of GNILC as well as the two-step MBB fit presented by the Planck collaboration in 2013. Conclusions: By exploiting sparsity we avoid the need for smoothing, enabling us to produce the first full resolution MBB parameter maps from intensity measurements of thermal dust emission.We consider the premise parameter estimates to be competitive with the existing state-of-the-art solutions, outperforming these methods within low signal-to-noise regions as we account for the CIB without removing thermal dust emission through over-smoothing. Authors: M.E. Jones, A.C. Taylor, M. Aich et al. The C-Band All-Sky Survey (C-BASS) is an all-sky full-polarization survey at a frequency of 5 GHz, designed to provide complementary data to the all-sky surveys of WMAP and Planck, and future CMB B-mode polarization imaging surveys. 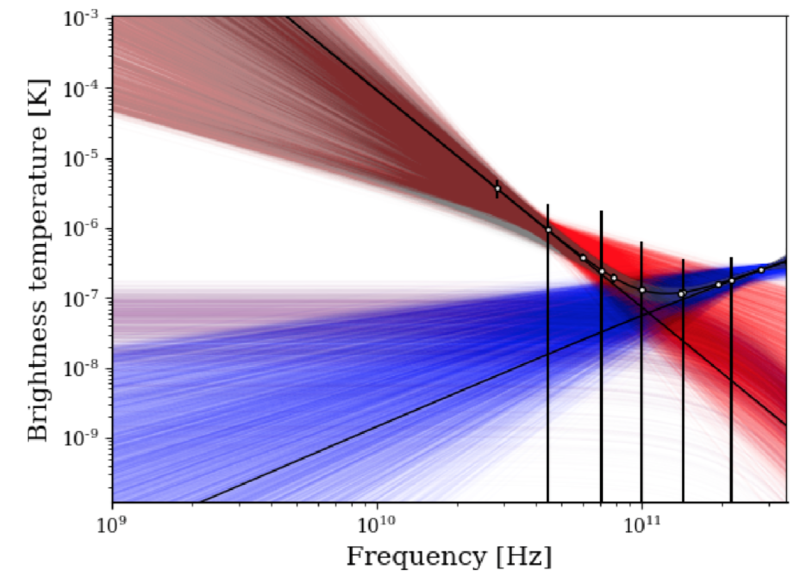 The observing frequency has been chosen to provide a signal that is dominated by Galactic synchrotron emission, but suffers little from Faraday rotation, so that the measured polarization directions provide a good template for higher frequency observations, and carry direct information about the Galactic magnetic field. Telescopes in both northern and southern hemispheres with matched optical performance are used to provide all-sky coverage from a ground-based experiment. A continuous-comparison radiometer and a correlation polarimeter on each telescope provide stable imaging properties such that all angular scales from the instrument resolution of 45 arcmin up to full sky are accurately measured. The northern instrument has completed its survey and the southern instrument has started observing. We expect that C-BASS data will significantly improve the component separation analysis of Planck and other CMB data, and will provide important constraints on the properties of anomalous Galactic dust and the Galactic magnetic field. Component separation for the Planck HFI data is primarily concerned with the estimation of thermal dust emission, which requires the separation of thermal dust from the cosmic infrared background (CIB). For that purpose, current estimation methods rely on filtering techniques to decouple thermal dust emission from CIB anisotropies, which tend to yield a smooth, low- resolution, estimation of the dust emission. In this paper we present a new parameter estimation method, premise: Parameter Recovery Exploiting Model Informed Sparse Estimates. This method exploits the sparse nature of thermal dust emission to calculate all-sky maps of thermal dust temperature, spectral index and optical depth at 353 GHz. premise is evaluated and validated on full-sky simulated data. We find the percentage difference between the premise results and the true values to be 2.8, 5.7 and 7.2 per cent at the 1 sigma level across the full sky for thermal dust temperature, spectral index and optical depth at 353 GHz, respectively. 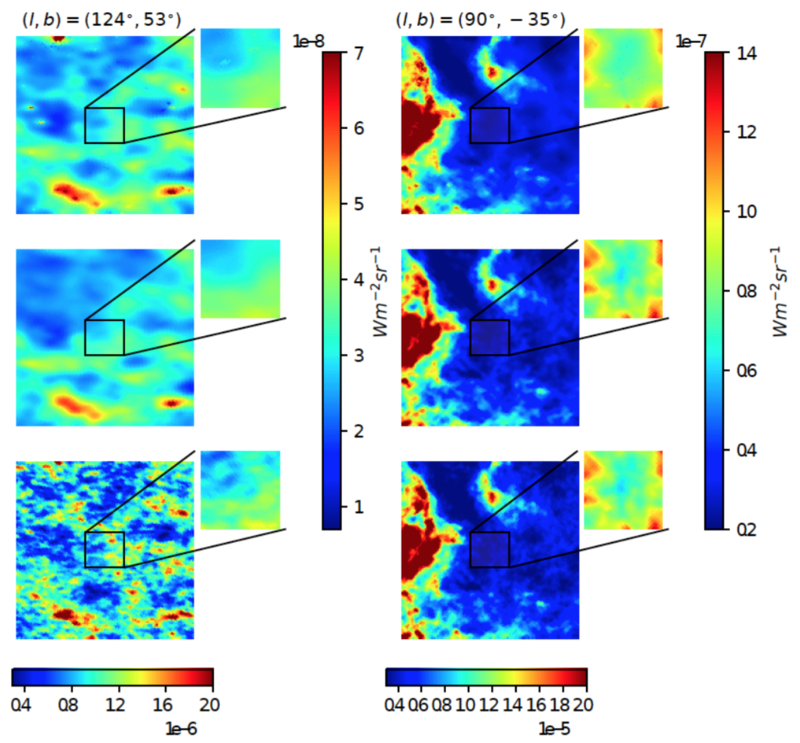 Comparison between premise and a GNILC-like method over selected regions of our sky simulation reveals that both methods perform comparably within high signal-to-noise regions. However outside of the Galactic plane premise is seen to outperform the GNILC-like method with increasing success as the signal-to-noise ratio worsens. Authors: M.O. Irfan, C. Dickinson, R.D. Davies, et al. 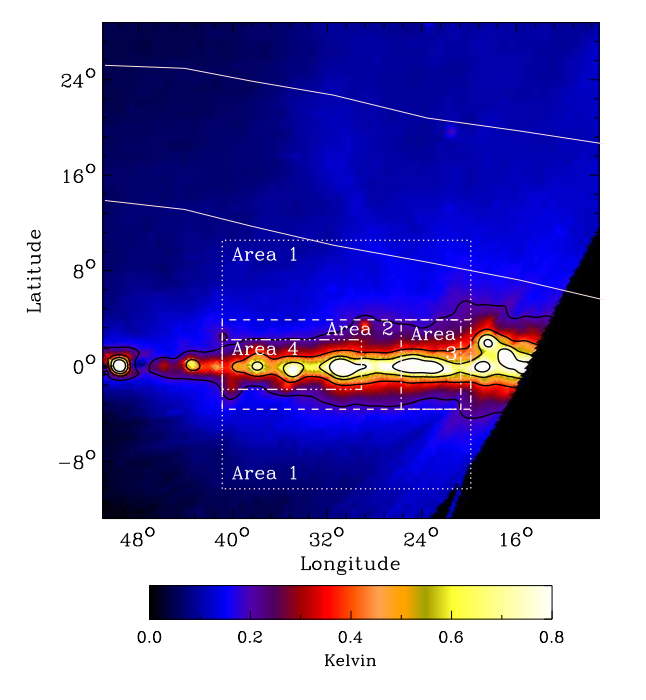 We present an analysis of the diffuse emission at 5 GHz in the first quadrant of the Galactic plane using two months of preliminary intensity data taken with the C-Band All Sky Survey (C-BASS) northern instrument at the Owens Valley Radio Observatory, California. Combining C-BASS maps with ancillary data to make temperature-temperature plots we find synchrotron spectral indices of β=−2.65±0.05 between 0.408 GHz and 5 GHz and β=−2.72±0.09 between 1.420 GHz and 5 GHz for −10∘<|b|<−4∘, 20∘<40∘. Through the subtraction of a radio recombination line (RRL) free-free template we determine the synchrotron spectral index in the Galactic plane (|b|<4∘) to be β=−2.56±0.07 between 0.408 GHz and 5 GHz, with a contribution of 53±8 per cent from free-free emission at 5,GHz. These results are consistent with previous low frequency measurements in the Galactic plane. By including C-BASS data in spectral fits we demonstrate the presence of anomalous microwave emission (AME) associated with the HII complexes W43, W44 and W47 near 30 GHz, at 4.4 sigma, 3.1 sigma and 2.5 sigma respectively. The CORNISH VLA 5 GHz source catalogue rules out the possibility that the excess emission detected around 30;GHz may be due to ultra-compact HII regions. Diffuse AME was also identified at a 4 sigma level within 30∘<40∘, −2∘<2∘ between 5 GHz and 22.8 GHz. O. G. King, Michael E. Jones, E. J. Blackhurst, et al. The C-Band All-Sky Survey (C-BASS) is a project to map the full sky in total intensity and linear polarization at 5 GHz. The northern component of the survey uses a broadband single-frequency analogue receiver fitted to a 6.1-m telescope at the Owens Valley Radio Observatory in California, USA. The receiver architecture combines a continuous-comparison radiometer and a correlation polarimeter in a single receiver for stable simultaneous measurement of both total intensity and linear polarization, using custom-designed analogue receiver components. The continuous-comparison radiometer measures the temperature difference between the sky and temperature-stabilized cold electrical reference loads. A cryogenic front-end is used to minimize receiver noise, with a system temperature of ≈30K in both linear polarization and total intensity. 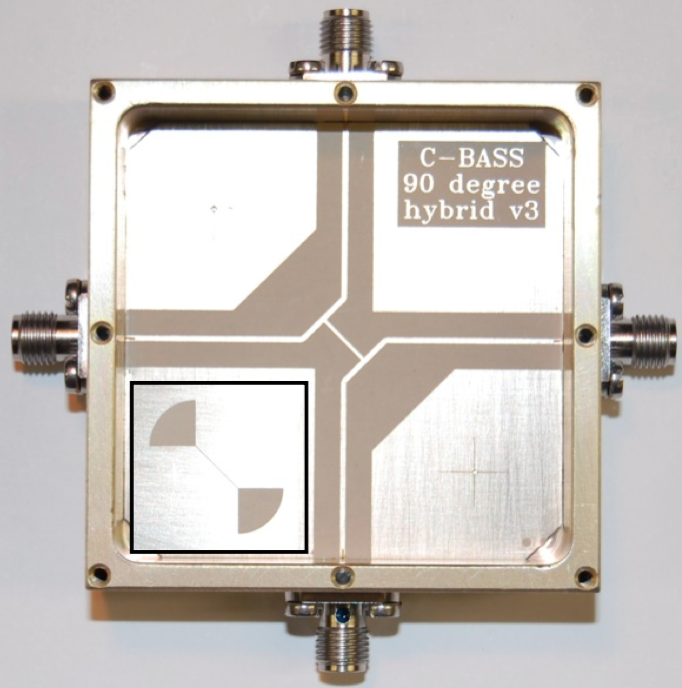 Custom cryogenic notch filters are used to counteract man-made radio frequency interference. The radiometer 1/f noise is dominated by atmospheric fluctuations, while the polarimeter achieves a 1/f noise knee frequency of 10 mHz, similar to the telescope azimuthal scan frequency.